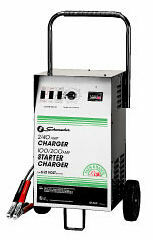 This versatile wheel-style starter/charger is great for both slow and fast applications on 6 and 12 volt batteries. High-output engine start will assist batteries in cranking most engines under severe summer/winter weather conditions. This product works well with: Autos, Light Trucks, Tractor & Farm Equipment, Motorcycles, ATV's, Lawn Mowers, Snowmobiles, Large Trucks and other 6 & 12 volt batteries. 13 3/4 X 13 1/2 X 20"